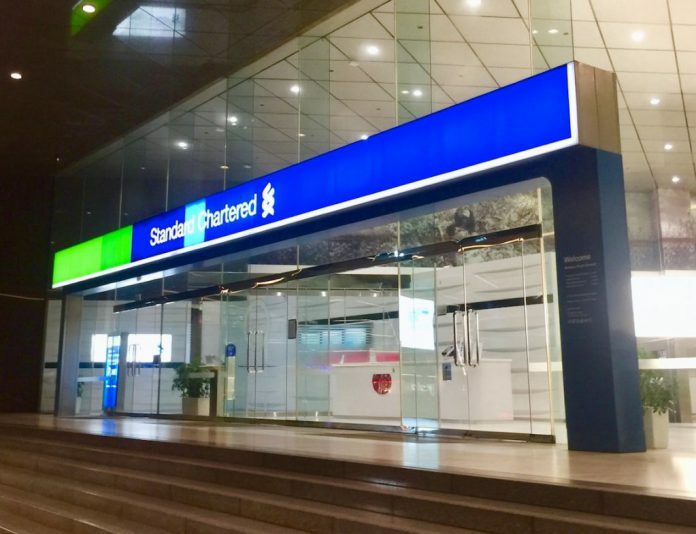 Standard Chartered Bank FDR 48-month fixed deposit rate to rise from 0.5% to 0.9%. It’s official. Our home loan customers have been calling us after they received the notice from Standard Chartered Bank (SC Bank). Following hot on the heels of DBS FHR Fixed Home Rate in raising it’s reference Fixed deposit rate. The fixed deposit rate is used as a reference in which to price housing loans in Singapore. The original creator of such packages is Development Bank of Singapore (DBS). They are soon followed by Oversea Chinese Banking Corporation (OCBC), United Overseas Bank (UOB), Standard Chartered Bank (SC) and Maybank (MB). Standard Chartered Bank’s impressive branch on Battery Road. As at the time of this article, OCBC has already withdrawn their Fixed Deposit Mortgage Rate (FDMR-36 month) pegged home loans and replaced it with OCBC OHR home loan referenced to the long term (12 years) average of Sibor, while Maybank (MB) has withdrawn their Fixed Deposit Mortgage Rate FDMR-36 month home loans on 26 Dec 2017. Standard Chartered Bank FDR 48-month Fixed Deposit rates to go up from 0.5% to 0.9% with effect 8th March 2018. Fixed deposit rate tenure from 15-month, 18-month, 24-month, 36-month, 48-month and 60-month have all gone up. After the rate hike, some of the packages taken in April 2017 would have become 1.98%. A home loan that is pegged to Fixed deposit rate has some cushion against a rising interest rate market. When the entire market rises as defined by Singapore interbank Offered Rate (Sibor), banks will have to pay their fixed depositors more interest to retain them. 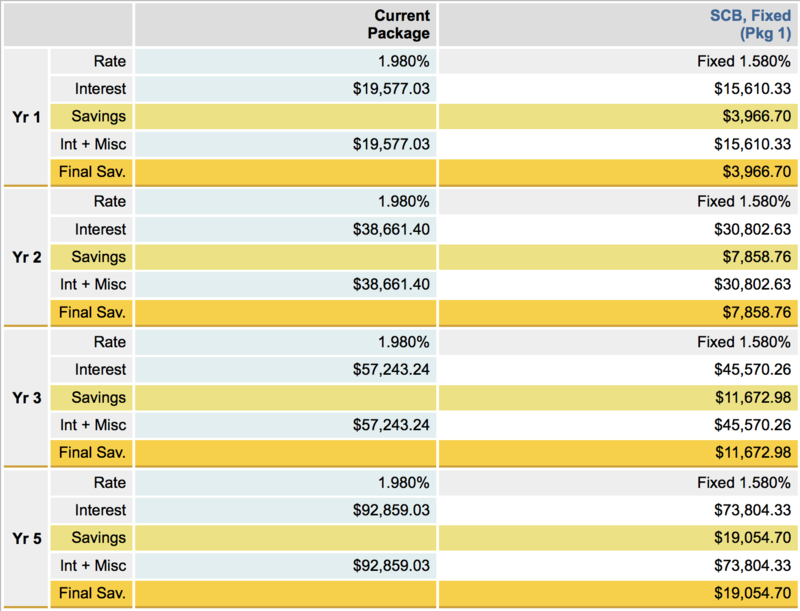 A 0.4% rate hike on the FDR 48-month will lead to you paying $19,054.70 more over a 5 year period. Table 3: Interest cost difference over 5 years and monthly instalment difference, iCompareLoan Home Loan Report. Please note that you cannot calculate the monthly instalment difference, rather you must calculate only the mortgage interest cost difference. During the time when the interest rate is less, the instalment is also less, but not by as much less, because during this time, you are paying up more of the loan principle. That means your mortgage loan outstanding balance is also dropping and will help you to save on future interest rate cost. Less outstanding home loan means more home equity. As to how much Sibor will rise, this will very depend on the US interest rates defined by the Federal Reserve Board. Though historically the Fixed deposit rates have risen less when Sibor also rises. Fixed deposit pegged rate is not immune to interest rate hike. Sibor is highly correlated with Federal Reserve Target Rate and hence is also on the way up with the Federal Reserve threatening 3 rounds of rate hike in 2018 and 2 rounds in 2019. For those who are not familiar, here is a link on DBS FHR to do a quick recap of the myriad packages that DBS created. You may want to read about mortgage terminology if you are totally clueless. Home owners who are still confusing fixed deposit rate pegged home loans with Fixed Rate home loans will be best to take heed from this and perhaps take action soon to refinance home loans or contact a Mortgage broker who can guide them through the myriad range of home loan packages. Home owners affected by the change can call the hotline to reprice to a fixed deposit pegged rate based on the 9-month Fixed Deposit Rate (FDR 9-month) which is currently at 0.3%. For those who are afraid that the FDR 9-month will also rise, perhaps they can refinance to fixed rate packages so as to have the certainty of mortgage repayment budget. Will Maybank Fixed deposit rate (FDR), UOB Fixed Deposit Pegged Rate (FDPR), OCBC Fixed Deposit Mortgage Rate (FDMR) follow DBS and Standard Chartered Bank? DBS tends to take the lead. After DBS has fired the first shot to raise the rates for the FHR 36-month Fixed Home Rate and Standard Chartered Bank has increased their FDR 48-month Fixed deposit rate, perhaps Maybank FDR 36-month and OCBC FDMR 36-month and UOB FDPR 36-month will soon change. With FHR-18 raise and Standard Chartered Bank FDR-36 raise, many banks will be tempted to also raise rates as the choice home owners will have will gradually diminish and most will end up paying higher interest rates. Refinancing home loan is one of the ways to lower your interest rate cost for the next 2 to 3 years. To read up more on property buying in Singapore, please click here or click here for the Ultimate Guide on Property Buying in Singapore. The post Standard Chartered Bank FDR Fixed Deposit Rate set to rise in March 2018 appeared first on iCompareLoan Resources.